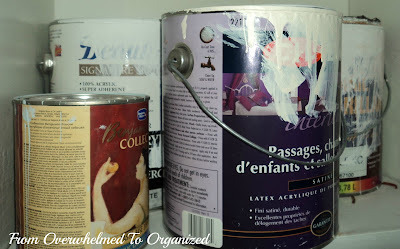 Do you have a pile of paint cans in your basement or garage that are left over after painting rooms in your house? You know, those cans of leftover paint that you keep for touch-ups or to use in other rooms or for other projects? Even if you aren't sure you'll use it, it seems like such a waste to get rid of it. After all, paint isn't cheap. We had sixteen cans of leftover paint! It took up this whole old shelving unit under our basement stairs, plus 1 can on the floor (not shown) that didn't even fit on the shelves. So messy! 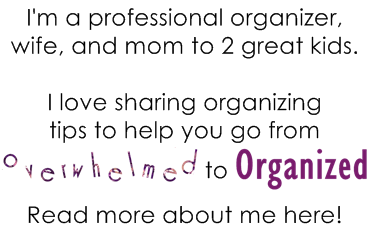 It was getting overwhelming and I needed a better organizational system for them. When I started going through these cans, some of them were nearly empty or getting rusty so I purged them. That still left me with 10 cans of usable paint. We actually have 2 unopened cans of paint that were left over when our basement was redone after a fire a few years ago. I'll keep those for now since the cans still seem to be in good condition. So, that leaves 8 other cans. What to do with them? 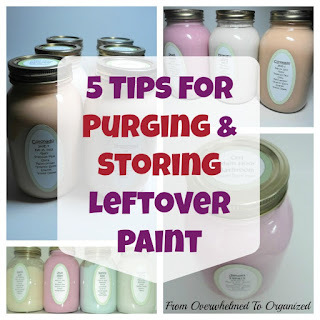 I found some ideas online that showed people storing leftover paint in plastic containers or glass jars or new small paint cans. Any of those options sounded better! I decided to get a case of mason jars and store our leftover paint in them since we needed to buy a few more before the end of the school year anyway (our kids always make "cookie-in-a-jar" mixes for their teachers). This was more cost effective than buying individually priced jars. Before I rinsed and recycled the empty paint cans, I noted all the key information so I could make labels. 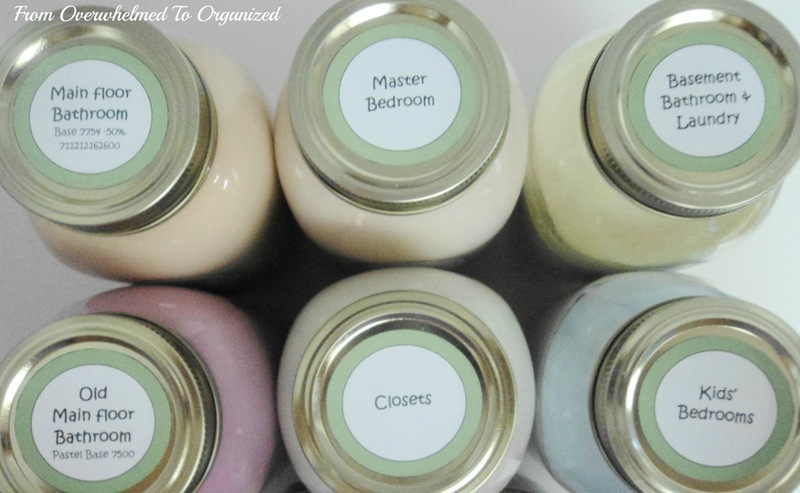 The colours look a bit different in the jars than they do on the walls, so I also made small labels for the lids to remind me which room each paint was from. There was so little paint in two of the cans that it seemed a waste to use a whole mason jar for each of them. I found two empty jam jars left over from a few years ago when I made jam so I used them. 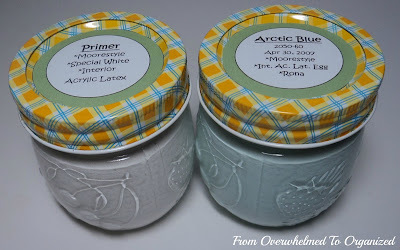 I made smaller labels for these jars; unfortunately, the outside of the jars is textured so the labels wrinkled. So I removed the labels. At least I know Avery labels stick well to glass! A little Goo Gone and they were clean. I love Goo Gone! 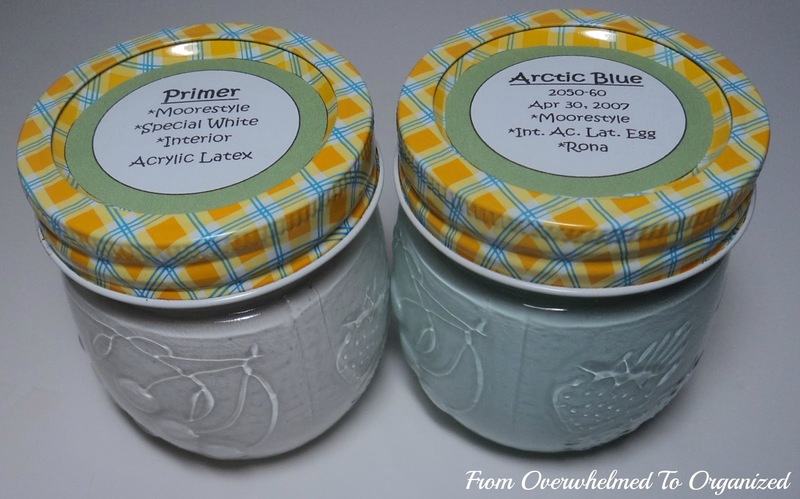 I created a special label for the lids of these two jars that contains the information that was on the original labels. There's plenty of paint in each of the jars to do touch-ups and even enough to use as accents on other items if I got crafty :) But it now takes up much less space! I'm storing these 8 jars and the 2 new cans of paint in a small cupboard in our basement kitchen that was otherwise underutilized. And now I have a whole empty set of shelves that can be used for something else! I haven't decided what yet... but we're still working on organizing our basement so I'm sure I'll find some use for it. Right now it holds our cat's litter, grooming items, and cleaning supplies. It needs a coat of paint, but now that I know exactly what paint I have, it will be no problem to find what I need when I'm ready to paint. 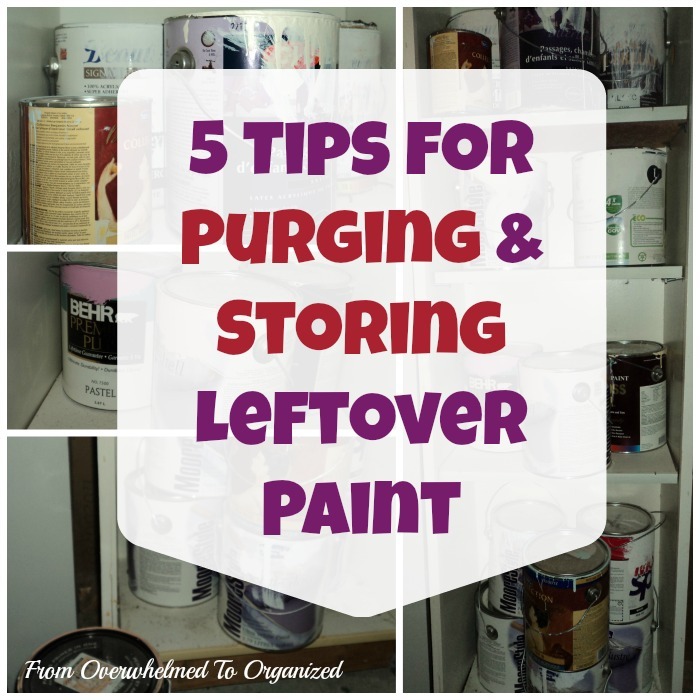 Purge any cans that are rusty or more than a few years old. Be realistic about what you will actually use. Unless you're a frequent DIYer or big-time crafter, don't keep a lot of paint "just in case" or for "someday". It's just taking up space, which could be used for something else to help make the rest of your home less overwhelming. 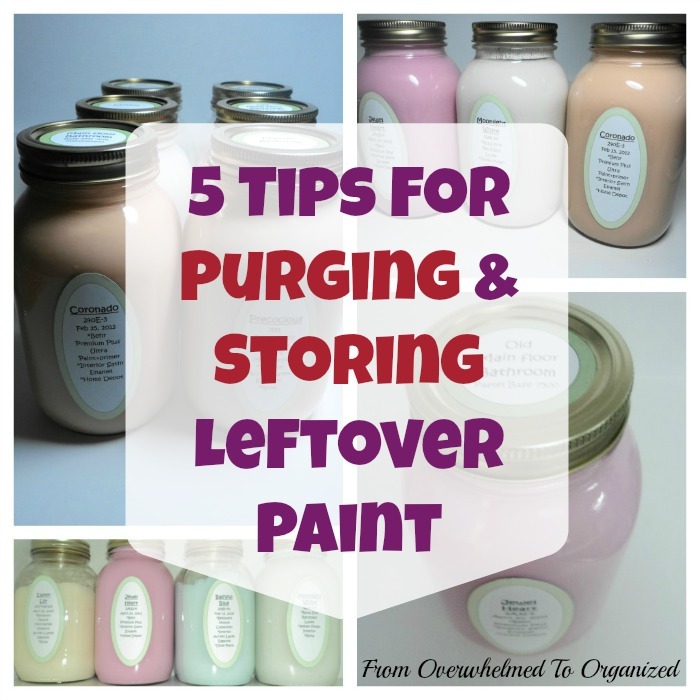 If you don't have projects in mind then purge most of the leftover paint (just keep some for touch-ups). Choose a container size based on the amount of paint you are going to keep (small container for touch-ups, medium sized container for future projects). Label every container with all the details from the original paint can that you may need to reference later. For more tips on organizing your basement, follow me on Pinterest. 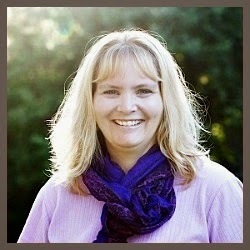 Follow From Overwhelmed To Organized's board Garage / Attic / Basement Organizing on Pinterest. I'm so happy my leftover paint went from overwhelming to organized! 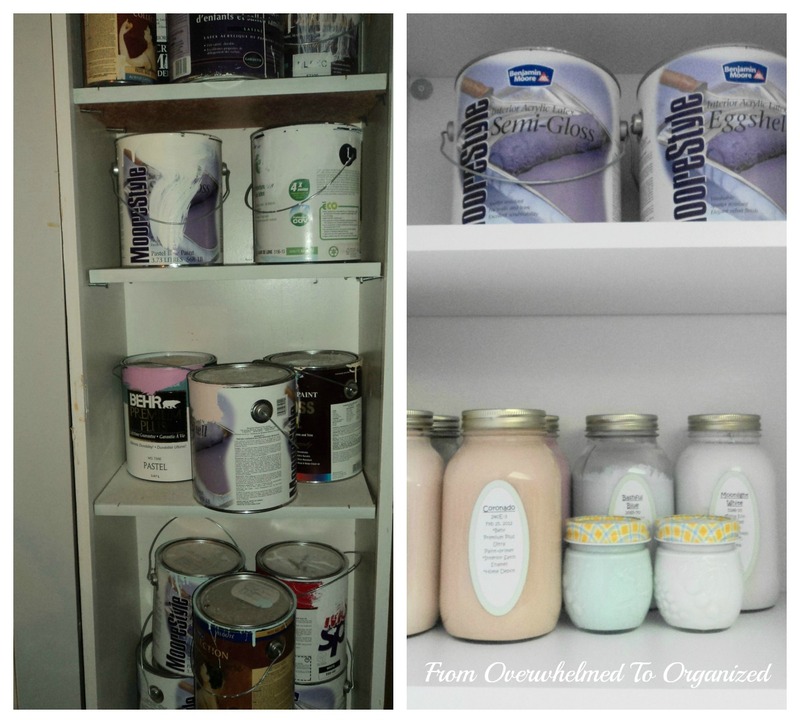 How do you store your leftover paint? 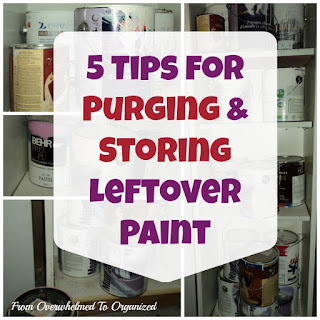 Have you purged your paint lately? I'd love to hear your ideas. Thanks Margo! I can't really take credit for it since I just adapted ideas I found online but guess that's how things work these days :) Thanks for commenting! This is such a good idea! I love all your organizing ideas. Wow Hilda this is amazing....I have 30 paint tins in my basement...wanna come over????? lol. WOW!! That is brilliant!!! Definitely Pinning this! Thank you! You're welcome and thanks for commenting & pinning! Who knew leftover paint could look so cute! Great idea! I was pleasantly surprised by that myself Jennifer! Such a difference from the junky old cans :) Thanks for commenting! Love this idea & it would be great opportunity to make a popsicle pallete of your colors that you could take with you while shopping to match things or just to have as a handy reminder for future projects! Thanks Nancy! I've never seen those popsicle stick paint chips but they look great and easy to make. Thanks for the idea! Thanks Rachel! 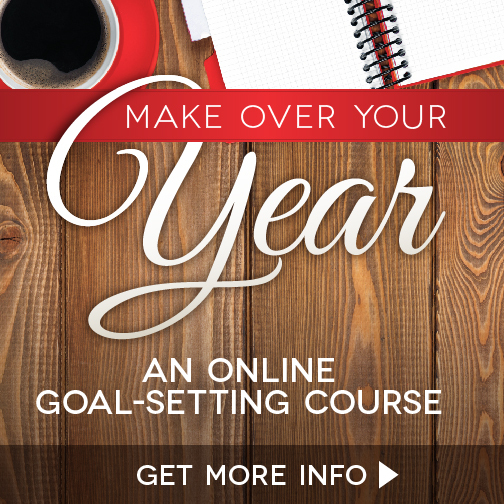 I love when something is functional and pretty :) Thanks for invite to your link party! I linked up & followed you on FB. I LOVE THIS! Where would I get mason jars? I'm not crafty at all so I'm a little clueless, but this seems easy enough I could do it. I have way too many cans of paints we'll never use for anything more than touchups...this would be so pretty and such a space saver! Thanks Jibberblog! 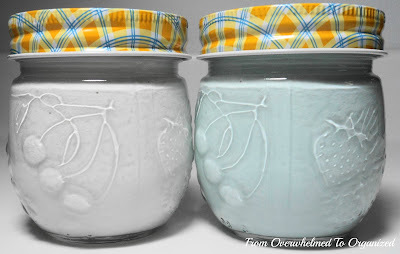 These jars were from Walmart. I'm not really crafty either but this was a pretty easy (& a little messy!) project. Knowing how much extra space I was going to have motivated me :) Thanks for commenting & please come back & link up pictures of your before & after! Oh I love how you made the paint look so pretty! And those cute labels... Great idea! Thanks Raquel! It took almost as long to do the labels as the actual paint part because I had to play with sizes & fonts to fit all the info I wanted on them but it was worth it :) Thanks for commenting! That is a very smart way to store your leftover bits of paint! When I read your post, I was thinking she's got 1/2 a can of this colour and 3/4 can of that etc but if thats all you have left in the bottom of each can - that totally works! In the past, we've taken our (almost?) empty paint cans and other cans of misc stuff to the local community hazardous waste days. We've free'd up so much space! BTW: The jam jars are very cute - where did you get them? Thanks Helen. I did have a fair bit in a couple of the cans but I knew I wouldn't be using it all anyway so I just kept a jar's worth. It's great to free up space by getting rid of stuff isn't it?! Home Depot & Rona also take partial cans of paint & they recycle the cans & use the paint to make recycled paint (which I've used & it's great). I bought the jam jars several years ago but I can't remember where. Likely Walmart or Zellers. The set had red lids too that were even cuter than these yellow ones. 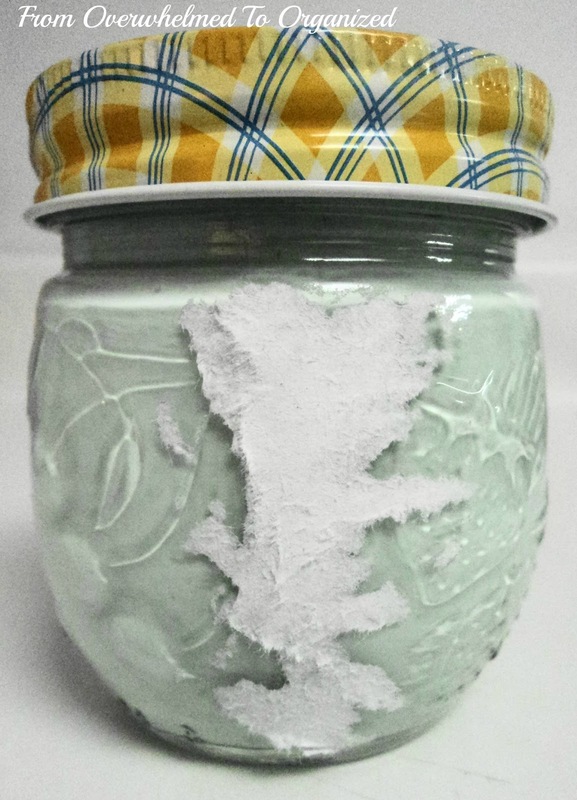 Forgot to ask - will you be reusing your mason jars once the paint has been used up/discarded? 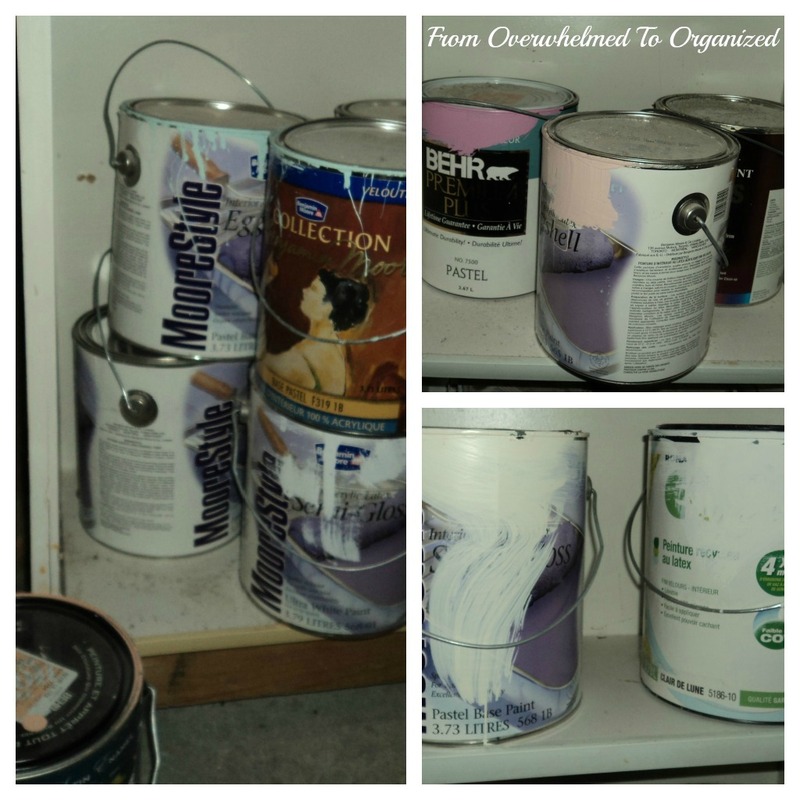 Are you storing latex paint? I'm not sure if I'll use the jars again for anything other than paint but it is all latex so it should be safe to use them again after a good wash. At the very least I can use them to store non-food items. Thanks for all your great questions! Thanks Candice! 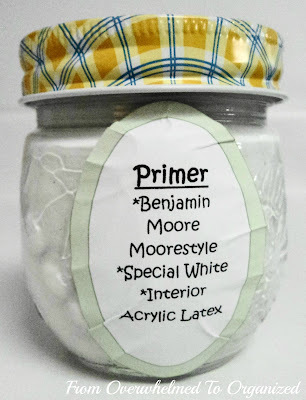 Great idea for a future post - a tutorial on how I do my labels :) Good luck with those basement renovations! Did Hilda ever do a tutorial on label making? If so, I cannot find it. Were the labels: Avery 22804 Easy Peel Print-to-the-Edge Labels? Hi Musings! I don't think I ever did do an actual tutorial. I'm sure you can use any labels you want, but for these labels, I made them in Word and played with shapes and sizes and colours and fonts to make what I wanted. I printed them on Avery 05263 mailing labels and then cut the ovals and circles out. It was awhile ago, but I think I downloaded the template from the Avery site so I knew the sizes and then inserted my shapes into the label spots. Hope that helps! This is brilliant!!! And really cute too. Almost cute enough to use as decoration. LOVE IT! Thanks! I smile whenever I see it (or think about it!). Never thought of it as a decoration but I definitely could put it somewhere less hidden than a cupboard. Thanks for the idea! What a GREAT Idea! We have paint cans everywhere now we just need to get organized! I'll be pinning this to my "helping hand" board on pinterest and am featuring on my Facebook Fanpage. I found your post from the Serenity You Saturday Sharing link-up. Thanks so much for sharing! Have a great day! Thanks BeanBugCrafts! Good luck organizing your paint! 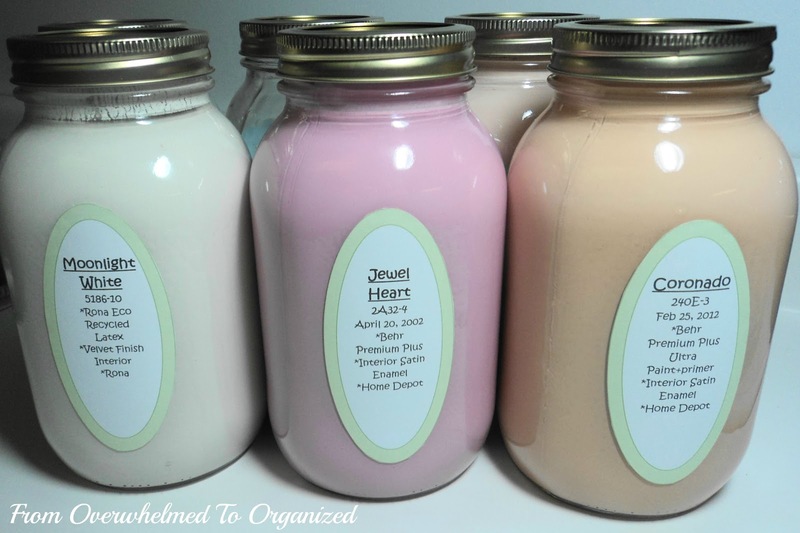 Great idea for storing the paint and I love the labels. 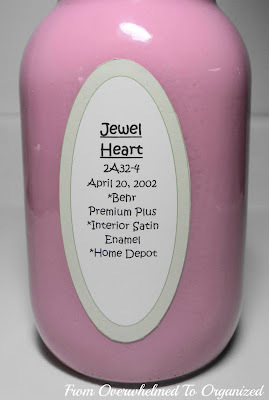 Thanks for linking to the Home Decor and Organizing Link Party. I'm featuring your great idea today. I am for sure going to use this idea! Let me know how it goes wannabegodly. Thanks for commenting! So smart Hilda! This is something that would clear out a lot of space in my garage because we have tons of almost empty cans out there. 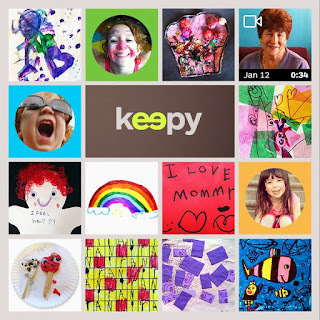 Thanks so much for sharing at Mom On Timeout! You will love the extra space Trish! We had the same problem, lots and lots of cans with a little leftover paint in each one, so I pulled out all of them that were interior latex in light colors (white, tan, pale blue, pale green, etc.) and poured them all into a clean 5 gallon plastic can and mixed well and then my husband and sons used it to paint the inside of the garage. It turned out to be a cream color and wow did that garage look great when they were finished! Wow Mindy! That's a great idea! Thanks for sharing. Thanks Kerry! You'll love it after you finish :) Thanks for stopping by & for commenting! You know I love this *wink! :) <3 I am your new follower! 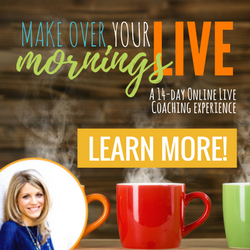 Can't wait to be inspired and encouraged by you! Thanks Leslie! People keep thinking I came up with this idea & I keep telling them I just copied it - from people like you! Thanks for the amazing idea. It's a popular one. 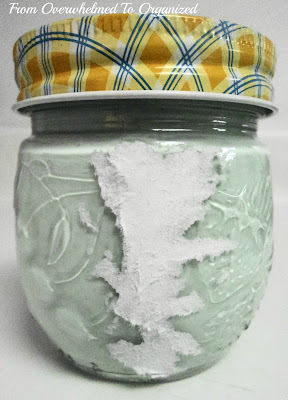 Guess lots of people are frustrated with leftover paint :) I love your blog. Thanks for commenting! Oh my goodness, this is genius! I am so doing this! Thanks for the idea! You're welcome Teresa! You will love it. Awesome idea! We have lots of paint taking up space in the workshop, this will definitely give us more room, as well as be prettier to look at. You're welcome Susan! You have a lot of cans and you seem to appreciate space as much as I do so I thought you'd like the idea :) Good luck with it! When you get out the bucket after long term storage it's such a pain to get all the settled pigment off the bottom of the can. If you don't the color may not match and the mixing can seemingly take forever. Good point. That's yet another reason why I like the jars better than cans! Regarding the settled pigment on the bottom of the can, can you take these cans to the paint store and have them jiggle and shake the cans with the mixer machine to make removing them from the can easier?? That's a good suggestion Anonymous. I'm really not a paint expert so I don't know much about pigment and paint and cans. The biggest issue for me was that my cans began to rust and the rust was mixing in with the paint. Thanks for your comment! Oh so pretty! I think I like this just because of how pretty it looks! Happy 2013! Great idea! I did this last summer to a few cans of paint but when I went to open one of them a few weeks later it was a real bear! Have you tried to open your jars or do you have any suggestions for making sure the lids don't stick to the jars? This came out great! I vow to try it.. if I could figure out where all my paint is stored! Thanks Kelly! Once you round all your paint up, it's really a great way to store it. I did the same thing, but my labels aren't as pretty. Where did you find the labels? Do you have a labelmaker or did you use your printer? I was looking for an example of how to do this. I got the traditional ball mason jars, so hopefully my labels can go on and not be wrinkly! I have a ton of paint in my garage. This would be perfect. This is actually a great idea. I do not know why I did not think about it already. I love doing things to be organized. You are so clever! I would like to mention that any readers with leftover paint they have no use for can donate it to the Habitat for Humanity ReStore.